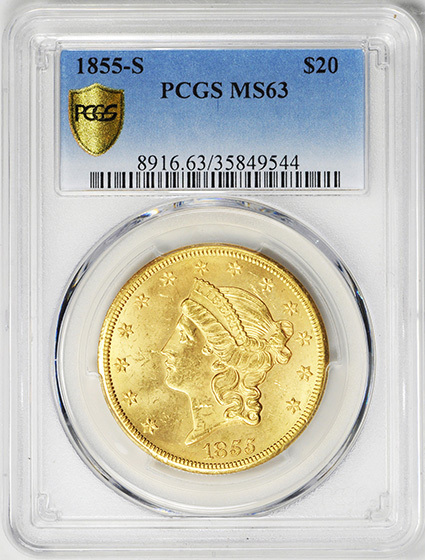 America’s largest circulating gold coin was the double eagle or $20 piece, born in the exciting years of the great California Gold Rush. The new mines yielded the greatest mass of gold in recorded history. 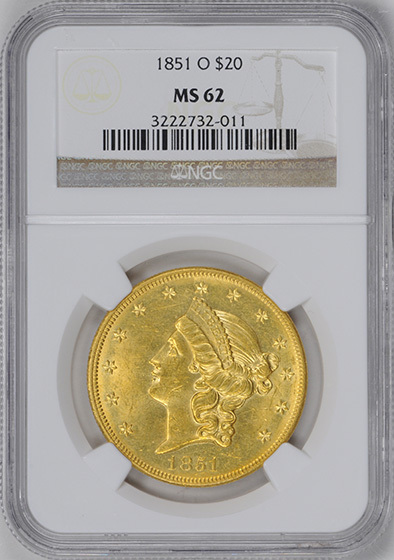 Vast quantities of the yellow metal helped to speed development of the American West and had far-reaching effects on the world’s coinage. The first California gold to reach the Philadelphia Mint was dispatched by the territory’s Governor, Col. R.B. Mason to Secretary of War William L. Marcy. Most of this shipment of just over 230 ounces was coined into quarter eagles, $2.50 pieces given an incuse stamp CAL over the eagle. 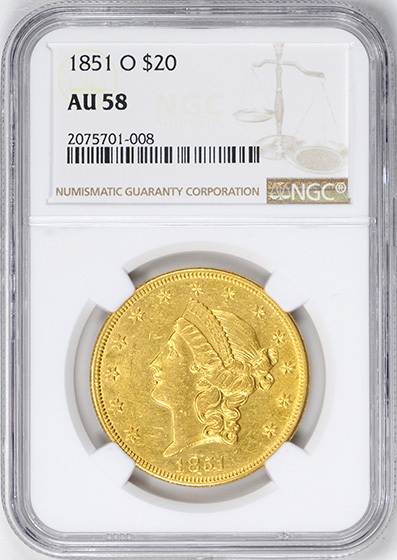 This coinage was small, but it soon became obvious that the sheer mass of gold reaching the mints was going to require a much larger denomination than the quarter eagle, half eagle and eagle then authorized. North Carolina Congressman James Iver McKay, a powerful member of the House Ways and Means Committee, had already prepared legislation authorizing the smallest U.S. gold coin, the gold dollar. 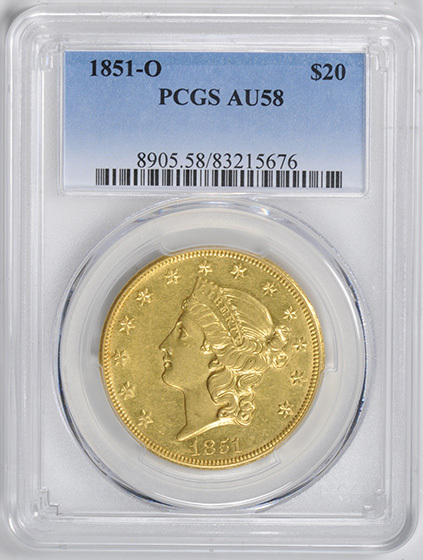 Acceding to the pressing need to mint gold into larger coin form, McKay was quickly persuaded to amend his bill to include another new gold coin at the opposite end of the spectrum, the double eagle or $20 piece. The authorizing statute was passed by Congress on March 3, 1849. Cushing Wright, and the corrupt Chief Coiner Franklin Peale feared that Longacre would disrupt his illicit medal-making racket. Patterson and Peale harassed Longacre mercilessly at every turn, forcing him to create three separate double eagle obverses before the first patterns could be struck bearing the date 1849 (Judd 117, 118). Longacre, whose initials JBL appear on Liberty’s neck, survived the campaign, and developmental patterns were struck in silver without a date in early 1850. Circulation coinage finally began on January 26. Longacre used a similar Liberty for both the dollar and $20, a handsome woman’s head displaying a meticulous nose and wearing a pearl-bordered diadem inscribed LIBERTY. It was modeled after an ancient Greco-Roman sculpture, the Crouching Venus. His reverse reflected his training as a two-dimensional engraver. Based on the Great Seal of the United States, it depicts a spread eagle with a shield on its breast, 13 stars in an oval with rays above. The nation’s name appears above, the denomination expressed as TWENTY D. below. These early twenties range from elusive to very rare in all Mint State grades. Branch mint pieces are particularly so, with many New Orleans issues numbered among the great rarities of the series. 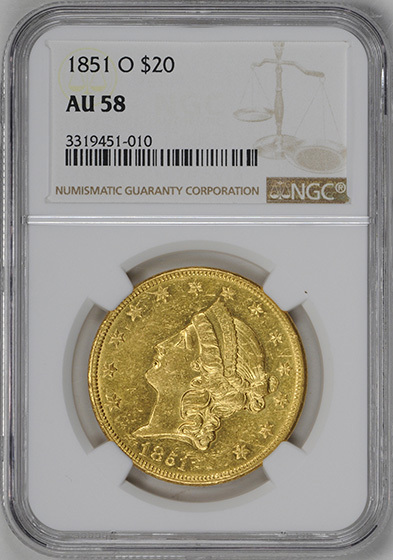 Low mintage New Orleans dates include 1854-O with 3,250 pieces struck; 1855-O, 8,000; 1856-O, 2,250; 1859-O, 9,100; and 1860-O, 6,600 pieces. The only overdate in the series is the rare 1853 over 2, discovered in 1959 by the late Walter Breen. Other legendary rarities are the Paquet Reverse issues of 1861 and 1861-S. These coins were the result of Mint engraver Anthony C. Paquet’s attempt to improve the reverse design. Paquet used tall, boldly elongated lettering for the legend and a very narrow raised border in place of the wide rim of the Longacre reverse. This rim was inadequate to shield the design from immediate wear and caused early die breakage as well. 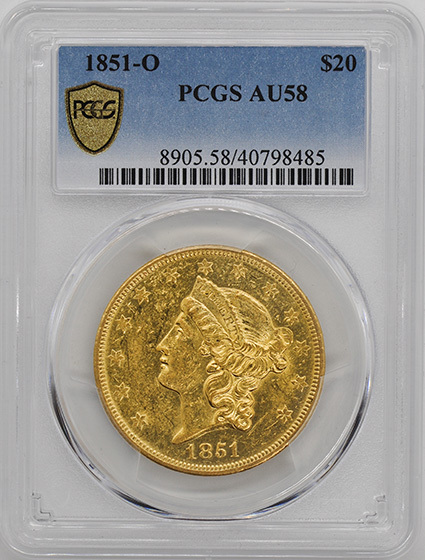 Only two 1861 Philadelphia Paquet Reverse double eagles are known—the MS-67 example in the Norweb Collection selling for a then-record $660,000. The San Francisco Mint struck 19,250 Paquet Reverse coins that made it into circulation before Mint Director Snowden’s frantic orders to stop coinage were received. Proofs of the series are excessively rare, with perhaps two known of the 1850 and 1854. Proofs were first placed on public sale in 1858, and three or four exist with this historic date. These first proof sets included the copper-nickel cent, silver half dime, dime, quarter, half dollar and dollar as well as the gold dollar, quarter eagle, half eagle, eagle and double eagle. The sets sold for $46 and appear today to have been a fantastic bargain. In the 1850’s, however, few working class Americans, merchants or professional people could afford to tie up the equivalent of five weeks’ wages that a $20 coin represented. 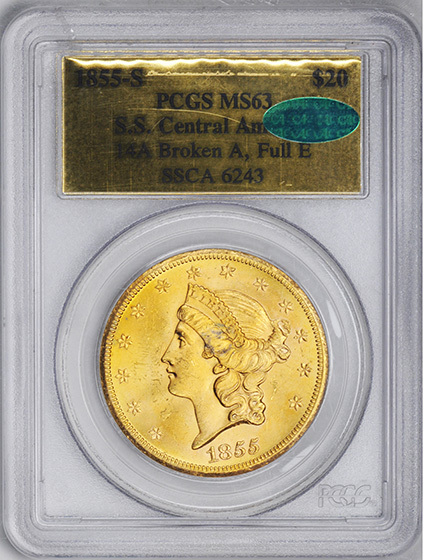 The few collectors then active were far more interested in large cents than in gold by date. 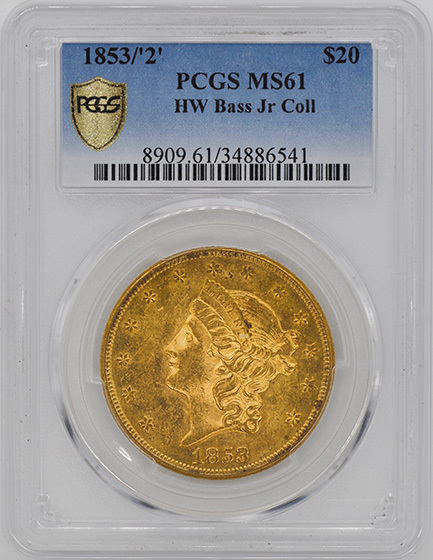 Many rarities, including the 1848 “CAL’’ $2.50 pieces, were casually released to circulation by their recipients. Individual numismatists such as Boston’s bean-baker Lorin G. Parmelee saved a few Proofs, but only the fabulously wealthy railroad magnate, John Work Garrett of Baltimore assembled anything like a run of early dates, including 1860 and 1862 through 1865. A similar situation exists for mint state early $20’s. Only bankers ever saw this coin in any quantity from 1857 to 1865. Very few uncirculated coins were saved, and most existing today came from the famed Baltimore Hoard of over 3,600 U.S. gold coins found by two young boys in an empty cellar in May of 1934. All of the coins were dated between 1834 and 1856. The hoard included 317 Double Eagles—92 dated 1850 and one 1856-O. Rarity levels have already changed for many of these early dates. Thousands of gold coins have been recovered from the wreck of the S.S. Central America, lost in a hurricane in 1857 with over three tons of gold on its way east from California. 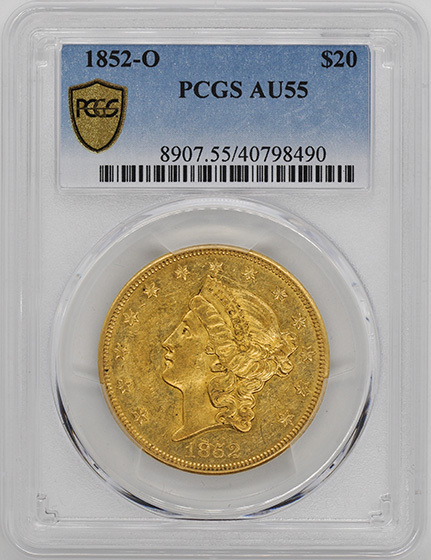 Discovered in 1987, hundreds of pristine 1857-S twenties, along with an assortment of other early gold coins and ingots, have been brought to the surface. The numismatic community eagerly snapped up these delicacies when they were marketed at the end of the last century. A smaller, but similarly high grade assortment of 1864-S and 1865-S double eagles was recovered from the wreck of the S. S. Brother Jonathon, and salvaging S. S. Republic has furnished the hobby with additional 1856-S through 1865-S twenties, as well as a large number of 1865 Philadelphia Mint pieces. 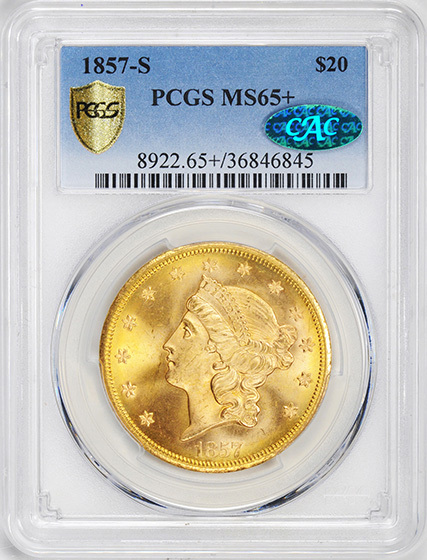 When grading double eagles, wear is first noticeable on the locks over Liberty’s ear and on the eagle’s head and neck. 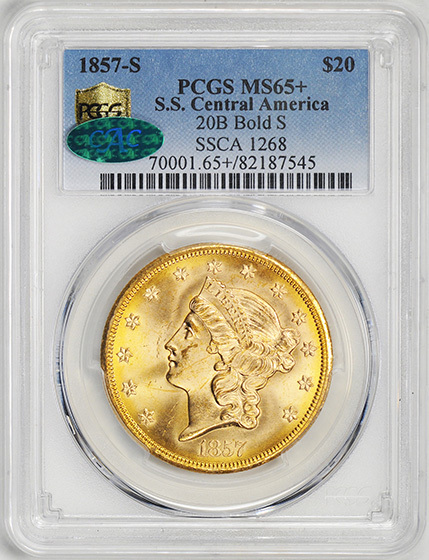 Bag marks are usually a problem with these large, soft gold coins. They generally picked up many bag, reeding and contact marks even before entering circulation. The lack of high quality and, in many cases, any specimens of some dates stops most from collecting this series by date and mintmark. It is more commonly sought as a “type” coin. In 1850, when the first double eagles were struck for circulation, American troops had just returned from a victorious military romp in Mexico, and a huge amount of gold was flowing eastward from the California fields. But in that year the primary focus of the country was on sectional rivalry, and how the Union could best be preserved. The patchwork of legislation that passed for a temporary solution became known as the Compromise of 1850, and it held the country together for ten more years—until 1861—before America turned inward on itself in bloody conflict. In 1866, when the second design for the double eagle was introduced, America was a vastly different country. The Compromise of 1850 lay as dead as the million young men that had given their lives on battlefields throughout the South. Reconstruction was proving to be a heavy burden on the southern states and also a political quagmire for President Andrew Johnson and the Radical Congress. However, no one in Washington could argue against the idea that the country needed divine direction to heal its recent scars. To that end, the Mint Act of 1865 included a provision that the motto IN GOD WE TRUST be placed on the nation’s coins. The idea that a religious motto should be added to U.S. coinage originated in 1861 when Reverend M.R Watkinson of Ridleyville, Pennsylvania—in a letter to Treasury Secretary Salmon P. Chase—urged that coins should carry a “recognition of the Almighty God in some form.” The Reverend suggested a design with a strong God and Country theme, and concluded his letter by stating, “This would relieve us from the ignominy of heathenism. From my heart I have felt our national shame in disowning God as not the least of our present national disasters.” Obviously agreeing with Watkinson, Chase instructed Mint Director James Pollock to prepare a device for coinage with such a motto in the “fewest and tersest words possible.” Over the next several years various mottoes were tried on base metal patterns including GOD AND OUR COUNTRY, GOD OUR TRUST, and finally IN GOD WE TRUST. The new motto was first added to dies for double eagles in 1866. The addition was relatively easy to accomplish by slightly widening the oval of stars above the eagle’s head and placing IN GOD WE TRUST within. Because of the double eagle’s larger size, the addition of the motto did not result in undue crowding of the devices as on the smaller, lower denomination coins. Mint Engraver James Longacre also made two other minor modifications to the reverse: the sides of the shield that were formerly straight, curve outward on the Type 2 coins, and the tail feathers of the eagle are lower and closer to the lettered devices on the lower reverse, requiring smaller mintmarks than on the Type 1 coins. Otherwise, the design was left virtually unchanged, with the large Greco-Roman head of Liberty on the obverse surrounded by thirteen stars, and a heraldic eagle in the center of the reverse, with the oval of stars above and a glory of rays above that. In the eleven years Type 2 double eagles were produced, a total of 16,160,758 pieces were struck in three mints: Philadelphia (no mintmark), Carson City (CC), and San Francisco (S). Mintmarks can be found on the reverse below the eagle. In general, Philadelphia coins from 1866 through 1872 are scarce, except the 1867—a hoard date that turned up in Europe in the early 1970s. 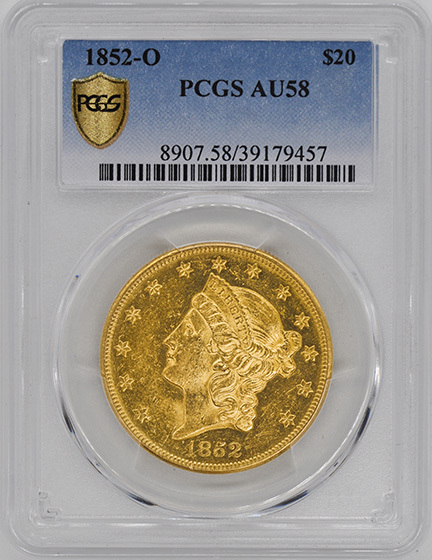 The 1873 came with two forms of the numeral 3 in the date, closed and open. 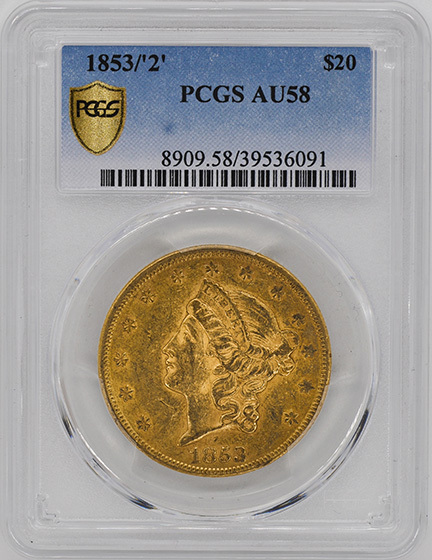 While the Closed 3 variety is one of the rarer coins in the series, especially in mint state, the Open 3 variety is among the most “common” issues, along with the last two Philadelphia issues, 1875 and 1876. The San Francisco branch mint produced large quantities throughout the 1860s. Apparently many of these pieces were used for international transactions—both during and after the Civil War—as foreign governments were suspicious of U.S. currency at the time. 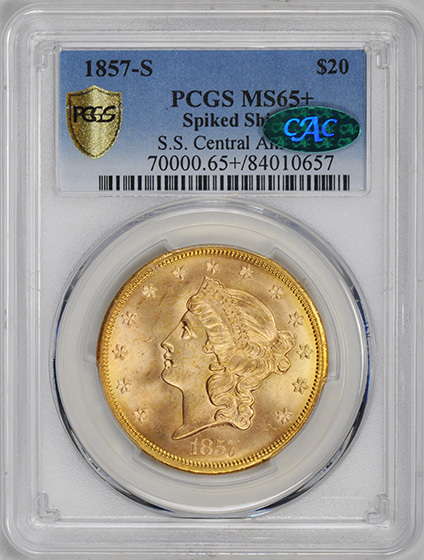 Coins from this mint are frequently encountered in VF, XF, and AU condition, but mint state examples are quite elusive. 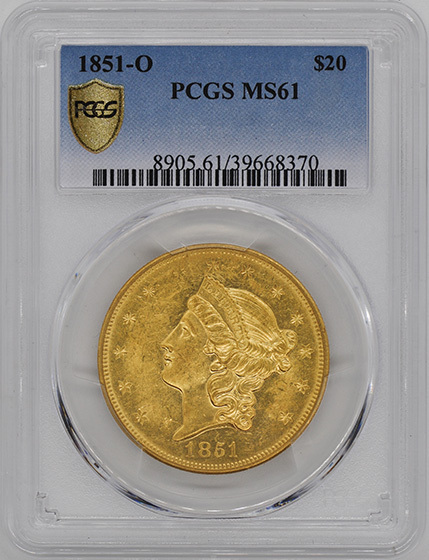 The 1873-S Open 3 is very rare in all grades and is easily the rarest S-mint twenty of this type. Other than the 1875 issue, all Carson City Type 2 double eagles are rare in mint condition, while the 1870-CC and 1871-CC are major rarities in that state of preservation. 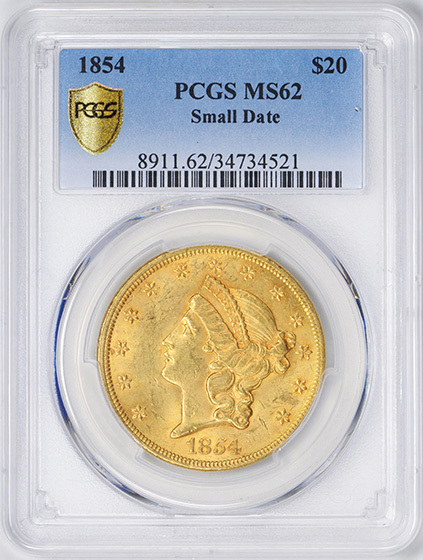 Only 3,789 pieces were struck of the 1870-CC and estimates are that today fewer than two dozen exist in all grades. It was during this era that Carson City coins were tainted with scandal: Allegations surfaced in 1871 and continued through 1873 that the mint was issuing lightweight gold coins. Although politically inspired, the accusations proved substantial enough to lead to the dismissal of Superintendent H. F. Rice. 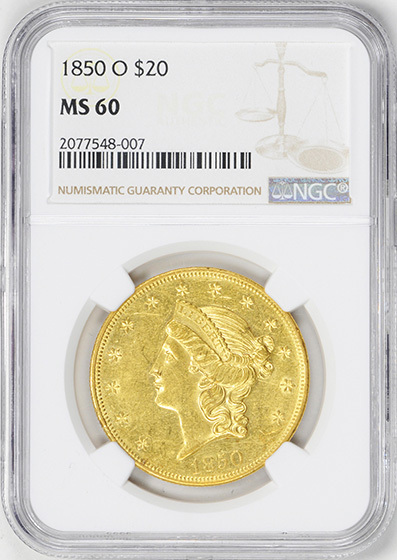 Many people in the West questioned the soundness of the CC twenties and frequently made “test marks” on the edge of that mint’s gold coins to be certain that underweight coins were not passed. This lack of confidence was serious business in the 1870s, as each double eagle represented a substantial store of value. Although collected by date and mintmark, the main demand for Type 2 twenties comes from type collectors. Advanced type collectors often pursue a representative example from each of the three mints, or possibly one of the 335 proofs struck, which are even scarcer today than the original mintages would suggest. The difficulty of completing a set of this design—particularly in high grade—precludes many from attempting this daunting challenge. In general, most Type 2 twenties in mint state are rare. Representing a month’s pay for many people, very few were saved. Those that survived extensive circulation in the West, rough handling in bank-to-bank transfers, or melting in the recall of the 30s—are few and far between. Grading parameters for Type 2 twenties are the same as those for the previous and succeeding coins, with friction evident first on Liberty’s hair behind the ear, eye brow and cheek; on the reverse, check the eagle’s wing tips, neck, and top of the shield. Counterfeits are occasionally encountered, as well as altered and added mintmarks on some key issues. The modified design of 1866 only lasted 11 years until changed again in 1877, this time by spelling out TWENTY DOLLARS in place of the TWENTY D. of the two previous issues. The Type 3 twenty would continue in production until 1907, when President Theodore Roosevelt committed his “pet crime”—directing a change in U.S. coin motifs, and engaging well-known artists to render designs. 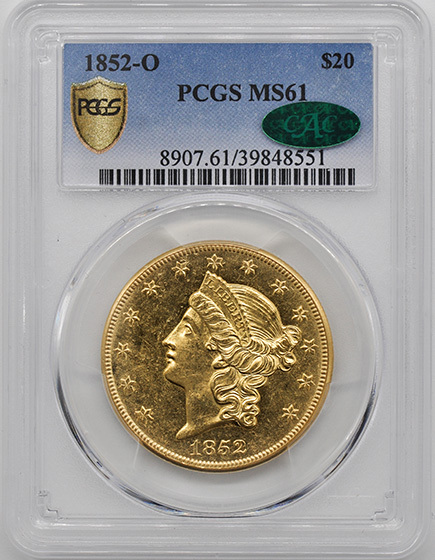 The resulting design by Augustus Saint-Gaudens for the twenty dollar gold coin was heralded as the most beautiful in U.S. history, and was used until 1933, when all U.S. gold coin production ceased. In the early afternoon of January 24, 1848, James Marshall was checking the progress of the sawmill he was building near Sutter’s Fort on the banks of the American River. There had been huge rainstorms the previous week that had washed away rocks, topsoil and sediment. Marshall noticed gold colored flakes everywhere between the pebbles and the next morning discovered a small yellow nugget on the bottom of the river. Skeptical, he rode on horseback back to Sutter’s Fort where he and John Sutter performed an assay on the metal he had found, confirming that it was indeed gold. It wasn’t long before the word of the discovery spread, precipitating the largest and quickest increase in the gold supply the United States had ever seen. 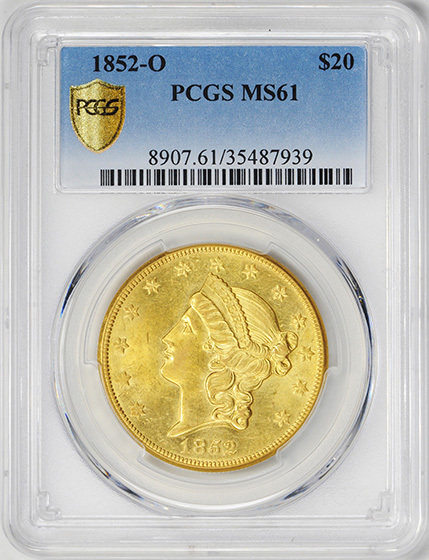 In Washington, Congress was debating a controversial bill that included two new gold coins that would eventually be minted from California gold. By February 1849, Mr. James I. McKay, the lame duck Representative from North Carolina, and Charles G. Atherton, Democrat from New Hampshire, had pooled their resources to develop joint legislation for a $1 and a $20 gold coin. It was argued that a high denomination coin might be more convenient to a depositor with a large amount of bullion. During the House debate, McKay observed that the Act of 1837 required the mint to deliver whatever current coins the depositor wished. As an inducement to pass the bill, the coinage authorization would be for two years only. The legislation wouldn’t be renewed if the coins proved unpopular. Many legislators were critical of the bill, but Senator Thomas Benton of Missouri predicted that the double eagle would be in greater demand than the gold dollar. He was right; the double eagle denomination lasted eighty-five years to the gold dollar’s forty. From 1850, when the first regular issue double eagle was struck, to 1933, when the denomination was suspended by the emergency decree of President Franklin D. Roosevelt, more than 174 million pieces were minted. The Liberty double eagle design is credited to James B. Longacre but has its roots in Christian Gobrecht’s $10 Eagle of 1839. The obverse features a Greco-Roman head of Liberty facing left, with hair tied in a bun and curls flowing down to the base of the bust. She is wearing a coronet inscribed with LIBERTY. Thirteen stars surround the bust with the date positioned below. The reverse depicts an eagle with outstretched wings holding an olive branch and arrows. A shield with straight sides (Type 1) gave way to a rounded ornate shield in 1866 when the motto IN GOD WE TRUST was added to the oval of stars above the eagle (Type 2). There is a pattern of rays in a semicircle touching each wing. In 1877, Chief Engraver William Barber tilted Liberty's head forward and replaced the denomination TWENTY D. with TWENTY DOLLARS (Type 3). When grading this design, look for traces of wear on the hair above Liberty’s forehead and behind her ear, on her cheek, and on the coronet. On the reverse, check for wear on the eagle’s neck and wing tips, and on the top of the shield. It’s usual to find an abundance of bag marks on these big, heavy coins. 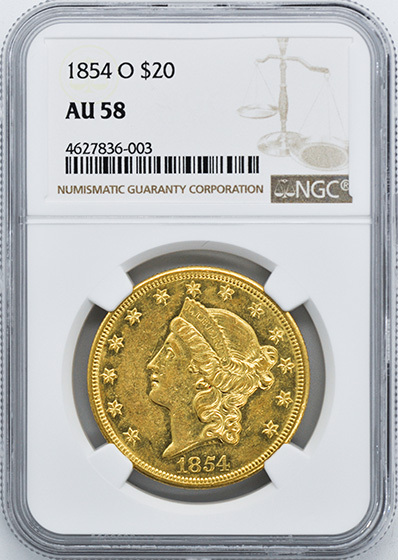 In recent years, average circulated, common date Liberty double eagles have been used as a hedge against inflation and as an alternative bullion coin to the Krugerrand, Maple Leaf and American Eagle. 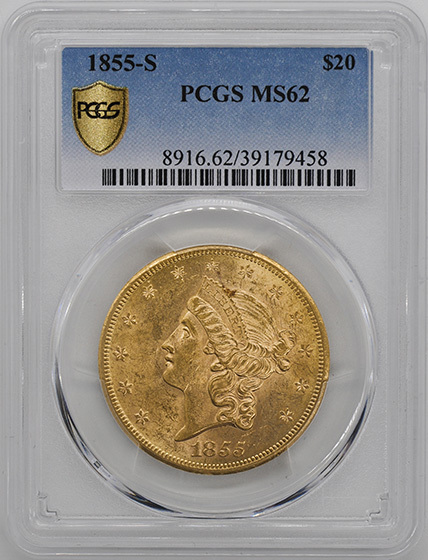 Students of Type 3’s will discover that though the mintage was vast, high quality uncirculated specimens are rare and the series contains several major rarities. These include the 1879-CC, 1879-O, the Philadelphia issues of 1881-87, and the Philadelphia issue of 1892. Alterations exist of the 1881, 1882 and 1885 issues with the “S” (San Francisco) mintmark removed. There is a certain tactile pleasure in handling these large gold coins. It’s hard to imagine when we look at today’s tokenized, clad coinage that these beautiful gold pieces were once used as money. Until the early twentieth century, gold was a universal currency that gave the holder economic freedom anywhere in the world. This freedom was revoked when gold was demonetized in 1933, but it has been restored today in the form of the credit card. Of course, to numismatic purists, the plastic card can hardly match the aesthetic experience of seeing or touching these magnificent double eagles.